Wake up with George - every morning. MORNING DELIGHT: Ease the pain of getting out of bed with the Zrike Co.'s Whatever It Takes "George Clooney" Mug. 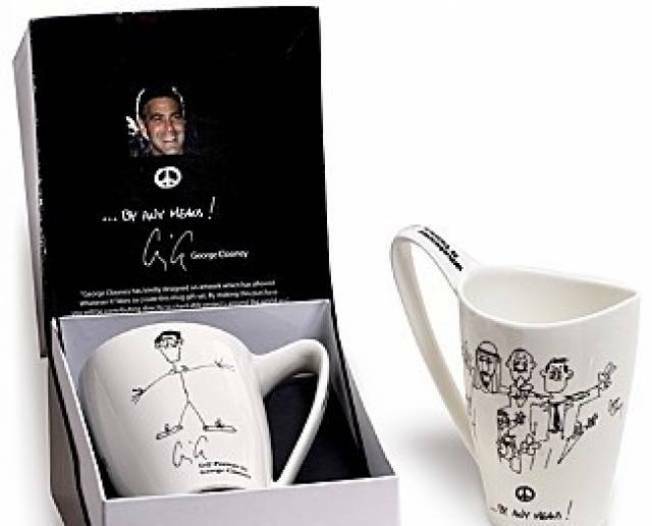 20 percent of proceeds from this ethically produced mug will be given to a Clooney charity of choice. Plus, it comes with a photo and personal message from George himself. Get this mug (and mugs from other celebs) at Bloomingdales. FABULOUSLY UNDERDRESSED: Get a sneak peak – literally – at Agent Provocateur’s new line of naughties this weekend. The lingerie store is having a live window showcase of their new collection Saturday from 2-6 p.m., which means scantily clad models wearing barely anything. Get a special gift with purchase too. 47 East Oak Street. NECESSARY SIDEKICK: A sleek, elegant clutch is the perfect addition to holiday frocks. The Virtue Fleur d'Or is made of stunning jacquard lining by designer Kaia Peterka. Pick one up at Perchance Boutique on Southport. HOT DATE: Commitment-phobes, beware. This paper weight and calendar will last for the next 50 years. Not only will it keep all your receipts and papers from flying away, but it’ll tell you what day it is too. Yep, every day. Get it at the Museum of Science and Industry Store. NATIVE KIND: A 100 percent soft cotton tee is a Chicago staple; after all, it’s made right here. The Men’s Short Sleeve Throwback Tee is made with textured puff ink and includes Old English “Chi” on the front and the Chicago crest on the back. Available at Chi Clothing Culture.